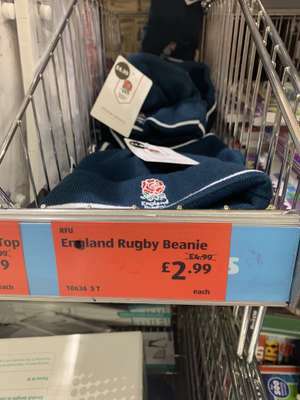 England Rugby Beanies from Aldi Found in my local store. Look cosy and has the Rose logo embellished on the front! They are £1.99 online at Aldi but with the £2.95 delivery, making them cheaper in store. "Found in my local store." Rugby, the sport fat kids played because they weren't fit enough for football. Adopted by nations who also cannot play football. Going by us coming back like we are i can see these being free "Mon Scotland"
Rugby, the sport fat kids played because they weren't fit enough for …Rugby, the sport fat kids played because they weren't fit enough for football. Adopted by nations who also cannot play football. Please do, that would amazingly generous of you. The caveat being, adult players only from rugby league or union. I think you should be able to attach footage using the HUKD app.